Description: Configure basic IGRP routing as per the instructions provided below. 3. Enter global configuration mode, and enable EIGRP routing on R2 (currently Autonomous number 0 is supported). Associate networks 192.168.2.0. 3. Configure the IP address as 192.168.2.1 255.255.255.240 and enable the interface status. 5. Configure the IP address as 192.168.1.2 255.255.255.240 and enable interface status. 7. Routing screen appears select EIGRP from the protocol list and click Edit button. 10. Click Add button again in Edit IP dynamic routing screen and enter 192.168.2.0 as network address and click OK button. Follow Step 8 and 9. 11. Select device R2 from Select Device drop down box Repeat the steps 2-7 for configuring router R2 S0/0 interface ip address as 192.168.2.2 255.255.255.240 and enable the interface and network address as 192.168.2.0. 13. 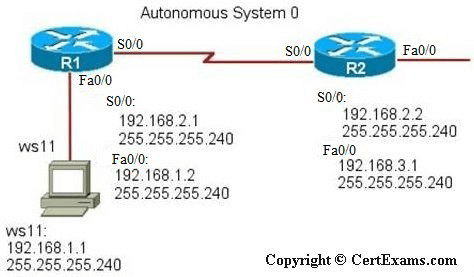 Check the connectivity using ping command from WS11 to S0/0 of R2. Choose Utilities > Ping and Traceroute options and enter 192.168.2.2 as destination ip address.